The second part in a planned five-film series of prequels to the Harry Potter franchise, Fantastic Beasts: The Crimes of Grindelwald is very much a middle film. There are enough tidbits and engaging set-pieces here to keep Harry Potter fans entertained, but not really enough to sustain an entire film. In fact, Crimes of Grindelwald seems to exist only to set up the next film, tantalizing us with clues and snippets of information but never really fully existing on its own. It's a collection of references and foreshadowings rather than a fully formed film in its own right. 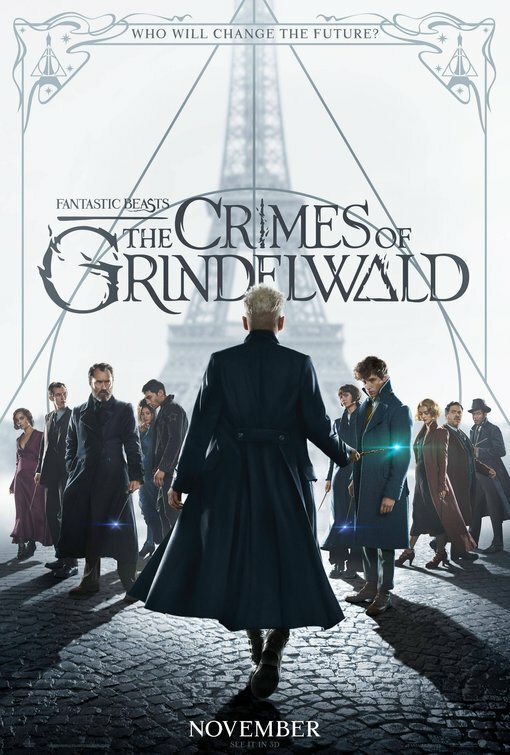 Picking up where 2016's Fantastic Beasts and Where to Find Them left off, The Crimes of Grindelwald finds awkward hero Newt Scamander (Eddie Redmayne) being sent on a mission by a young Albus Dumbledore (Jude Law) to track down Credence Barebone (Ezra Miller), the deadly obscurus from the first film who is now being sought by the dark wizard Gellert Grindelwald (Johnny Depp) because of his immense power. As Grindelwald's influence over the wizarding world grows, the stage is set for the fabled first wizarding war, as Grindelwald seeks to subjugate muggles in order to bring the world's witches and wizards out of hiding and into the real world. That's about where the clarity of the plot ends. The Crimes of Grindelwald is chock full of subplots and obscure bits of J.K. Rowling's wizarding world lore, but very little of it adds up to anything particularly satisfying. Grindelwald's Trump-ian rhetoric, demonizing those who are different in the name of some vague, wrong-headed idea of freedom gives the film some timely relevance, but it's all lost amid a flurry of exposition and arcane Potter mythology that feels as though Rowling is trying to cram as much backstory to the Harry Potter novels as possible without allowing the Fantastic Beasts series to live and breathe on its own. That's not to say that there aren't some terrific set pieces here - a circus scene featuring the woman who will one day become Voldemort's pet snake, Nagini, is a visual wonder (but begs the question of why we needed a back story for Voldemort's snake), and Grindelwald's climactic rally offers a chilling look into how easily good people can become radicalized by seductive demagogues. Like its Academy Award winning predecessor, the film is gorgeously designed; featuring sumptuous costumes and lavish sets that immerse us into the wizarding world of 1920s Paris, and James Newton Howard's sweeping score is some of the composer's finest work in years. The problem is that it's all in service of an inert narrative that ultimately leads nowhere, resulting in a film that is very much less than the sum of its parts. Not much actually happens in The Crimes of Grindelwald; much dialogue is spent on exposition (including several scenes and flashbacks dedicated to expounding on the Lestrange family tree), but the film doesn't actually have a story of its own. The climax is a bewildering CGI showdown, followed by still more exposition topped off by a last-minute twist that seems to be the only reason the film exists in the first place; yet still somehow adds nothing to the story we've just experienced. If the goal was to leave audiences wanting more, it succeeds. Unfortunately, we have to sit through an entire film to realize that we've just watched an extended teaser for yet another film that promises to answer all our questions at a later date. One has to admire the way Rowling has attempted to deliver a wizarding world for adults who grew up with Harry Potter, but this dark and joyless film is bound to leave audiences scratching their heads than experiencing any kind of wonder. FANTASTIC BEASTS: THE CRIMES OF GRINDELWALD | Directed by David Yates | Stars Eddie Redmayne, Katherine Waterston, Alison Sudol, Dan Fogler, Jude Law, Ezra Miller, Johnny Depp, Zoë Kravitz | Rated PG-13 for some sequences of fantasy action | Now playing in theaters nationwide.